My first stop is Maidenhead, near Reading, a wealthy commuter town of around 60,000 residents, deep in the heart of the Thames Valley. My first impression of the town (based only on a drive from the station out to the beautiful village of Cookham) was of large, featureless brick buildings – a Travelodge, Sainsbury’s, Odeon – though apparently there’s a more scenic part down by the river. Transition Maidenhead (TM) and surrounding villages started about 5 years ago, and consists mainly of people who live in the green belt that still surrounds the town. As Cindy pointed out, the fields of wheat waving damply in the breeze are what keeps the brick sprawl from absorbing these lovely little pockets of ‘traditional’ England, at least for now. 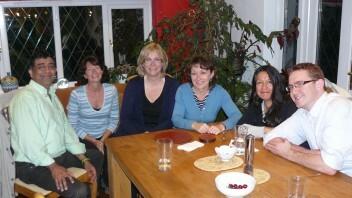 Over dinner (left to right in photo above Rajiv, me, Mary, Cindy, Sandra and Ben) told me about TM’s projects and enterprises, and their recent strategy day. On Thursday 19th July, the first foodnation hub in Maidenhead will be open for business. This is based on a model called Food Nation, a social enterprise. The founder, Louise Campbell, was interested in mapping the availability of organic fruit and vegetables across the south east, and making this information easily available. With funding, she developed a website and phone app (download for free) that will tell you your nearest producer, retailer or other outlet. People can then choose to go and buy it themselves directly, or to go to a local Food Nation hub and collect a pre-paid box of local organic produce. For the hubs, Food Nation provides the online ordering system, buys the produce at wholesale prices, then receives the customers’ payments. Volunteers run the hub in a local venue maybe once a week, and are themselves paid in highly discounted produce. There is also a commitment to give 4 hours of volunteer time per month. This model is also being tried in Transition Letchworth. 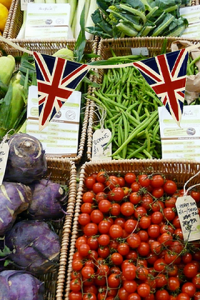 One of the findings that emerged from Louise’s research was that the Thames Valley is a ‘food desert’ with a limited range and quantity of organic food currently produced there. The main agricultural output is beef, with wheat and other feed crops for the cattle. I wonder how these opportunities for developing the local food supply in such a desert – raising awareness with residents of what organic fresh food and veg is already available, how you can easily get it, as well as building the capacity of local farmers to meet a growing demand (and in which they can have confidence to warrant significant change in their business model) can best be harnessed? And how can this significant amount of work be resourced adequately, rather than fall on the shoulders of over stretched but passionate volunteers? We talked about the strategic economic evaluation work that is nearing completion in Totnes, and how we have quantified the potential value of the local food economy, along with a number of prioritised projects that need to happen to deliver this potential. 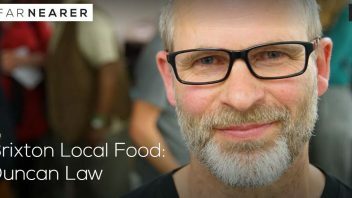 This includes analysis of required food processing facilities, research on which food crops are grown locally and which could be, if our aim is to improve our local food security (unlike Maidenhead, Totnes is surrounded by fruit and veg growers, mainly the Riverford effect I suspect), provision of growing space, re-skilling and working closely with local farmers and producers to connect them direct to the consumers and local retailers – this forms our strategy for developing our local food economy. We’re also looking at other economic sectors and more information will be available in September 2012. Some other local non-Transition activity includes the Reading True Food Co-operative (a shop and weekly pop-up shops in community centres – i.e. mobile markets) and Cultivate Oxford – a mobile greengrocery delivers local organic produce to neighbourhood drop-off points. TM were awarded £5k in the recent DECC LEAF funding round. This paid for a number of modelling reports as well as the the time of Sandra, Ben and others to assess the energy efficiency of two community buildings, and make recommendations including detailed technical plans and drawings. Ben works for a private energy services company (ESCO) that is very successfully using the incentives like the Feed in Tariff and Renewable Heat Incentive, to develop renewable energy projects. With an eye on the upcoming Green Deal in particular, we talked about how communities could harness this opportunity as well. The Green Deal is the government’s flagship project for stimulating domestic energy efficiency improvements. It will offer loans to homes that will pay for the improvements (new boilers, solid wall insulation, cavity wall insulation etc.) based on an assessment by a certified assessor. The idea is that the resulting savings on the energy bills will be used to pay back the loan. The new idea here is that the debt is tied to the house, not the individual and that cash flow should not be a barrier to sorting out our housing stock’s energy leakage! The problem is that there’s still a lot of uncertainty around the Green Deal, and no one seems to know quite how it will all work until it’s up and running. The risk, as we see it, is that the Green Deal may be sewn up by the big corporates, who have been working with the Green Deal designers since its inception. For example, Tesco may offer a complete package of assessments, loans and equipment/services to a community. Where does this leave the local suppliers and service providers? If they cannot get access to the same mechanisms as the big players, how can they compete? So with this in mind we are thinking of exploring further the idea of a community-led Green Deal model. It would be great to get a pilot underway in a Transition town that works with all the local players, and shows the additional benefits that would come from a model that is anchored in local supply chains and services, that retains as much of the money as possible in the community, and where any profits are re-invested locally. Clearly the Green Deal is only a mechanism, and unless it’s able to motivate people to take on debt and undertake what might be disruptive changes to their home, then its impact will be limited. After all, many people can afford to pay for such improvements today and they’re not doing it! This motivation aspect is something else that Transition brings to the table. So watch this space – contact Ben if you have interest here or news to share about how your community is responding to the Green Deal. The Solar Co-Op was the first enterprise to spin out of TM (this seems to be a pattern, that often Transition energy groups develop into a community-owned or community-led energy company). It’s aim is to help community projects with renewable energy installations. That help can include design, specification, selecting suppliers for installation, managing installation, raising community finance. 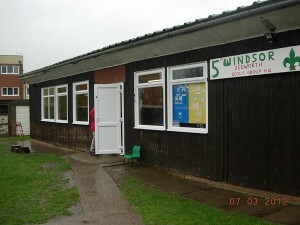 It completed its first project in November 2011 at The Gloucester Resource Centre, Gloucester. It helped form the Gloucester Community Energy Co-op to manage this on an ongoing basis, together with Transition Cheltenham. It managed the installation of a 46Kwp solar pv system, which equals 196 pv panels. 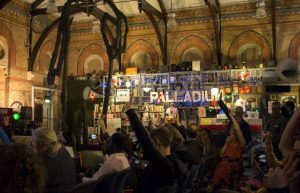 Initially raising £10k in short term loans from the local community and in March 2012 launched a community share offer for £120,000 that sold out in 6 weeks. MaidEnergy too spun out of TM. It’s a cooperative that’s helping a group looking at covering a section of the M40’s sound barriers with solar PV – what a creative use of sunny vertical space! Other local projects include Transition Marlow’s potential hydro project on the weir to serve maybe 35 homes. Basingstoke also has a Transition-linked ESCO, and the Low Carbon Chilterns Co-Op (established from various Transition Initiatives near High Wycombe) has also recently used LEAF funding to create a social-enterprise business plan. So there is quite a bit of energy enterprise emerging in the area. The Solar Coop advised in the early days of setting up the Basingstoke ESCO, and TM members are in contact with the other local groups and are looking to set up a meeting to see how the various projects can learn from and support each other. We talked a little around reciprocity – what might enterprises that have spun out of TM give back, so that TM can continue to help support the emergence of more enterprises and jobs? There’s a general sense that this giving back is important, but it’s not clear how this might work. This is a common theme in many of the TIs I have spoken to, and Frances (Totnes) and Mark (Hebden Bridge) are looking at some ideas for how this might work for them – this will be shared asap. TM held a strategy day last Saturday, to look at where best to focus their limited resources (around 8 people are active in the core group, and about 200 active online though not necessarily gettting stuck into projects). Until now, people have tended to pursue their own projects, and with a lot of success. But now they have decided to go back to first principles, to do more outreach activity and grow their numbers. They are interested in how to maintain momentum from the projects and connections so far, but without lots of ‘talking’ meetings which tends to lose momentum! 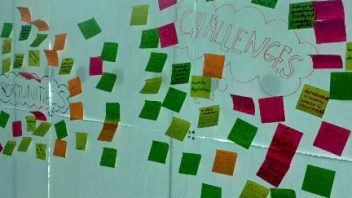 For example, do more things like the Apple-A-Fair – last Autumn, having spotted all the unused apples wasting away, Rajiv arranged a community apple pressing day in a local park with over 50 people. They also aim to build on connections created at an event in 2009, a local business summit at The Royal College of Agriculture which was chaired by Rt Hon Theresa May MP, with over 20 locally based companies and organisations. Rob Hopkins and Patrick Holden were the main speakers. TM has a good relationship with the local chamber of commerce and the council, and are exploring further local economy ideas. They would also like to generate some income, even a few thousand pounds would help fund events and speakers and this feels doable. We talked about how in the early days of TTT, a generous local resident donated £5k which was used to pay someone to write funding bids (for a prioritised list of projects). This raised over £80k! Some of these projects are still underway and led to more funding and now, some income streams. In terms of local economic development, a number of enterprises are emerging in the key areas of food and energy, and there is interest in how some strategic work might help accelerate the spread and scale of new businesses and jobs. The question, as ever, is how this additional work might be resourced – how can people wanting to do this core Transition work be paid in some way? There is no shortage of the required skills, it’s just the capacity… this is something I am hoping to explore further as my trip proceeds… what different ideas and models are out there? PS also wanted to mention the Craft Coop, a collection of local crafters all working together to support each other and the local economy. They have taken over various empty shops in Maidenhead town centre for extended periods, all with the support of the council and local chamber of commerce…. right, next stop Lewes. Written by Fiona Ward, July 24th 2012.